Dress to the nines and serve Mum a fancy high tea for her special day. We can’t think of anything more delightful than an elegant high tea to say thanks to Mum on Mother’s Day. As well as scones and cakes, tea sandwiches are traditionally on the menu. But if you’re racking your brain for something different, try our sandwich combos below. 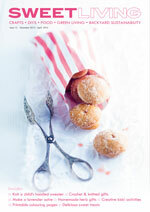 They’re big on flavour and provide a suitably deluxe touch. Make sure you dress in your Sunday best. A plain hat can be jazzed up with a few faux or fresh flowers. Make one for Mum too. A slight variation to the traditional English egg sandwich. 1. Peel hard boil eggs and mix in mayonnaise, spring onion, mustard and dill. Use a fork to break up the egg and mix it all together. 2. 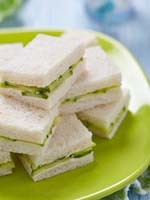 Lightly butter the slices of bread and place a layer of iceberg lettuce on 2 slices. Top with egg mixture and top with remaining slices of bread. 3. Trim crust and either cut in triangles or small rectangular slices. 1. Combine wasabi and cream cheese in a bowl. 2. Spread mixture evenly over the 4 slices of bread. 3. Place smoked salmon evenly over 2 slices and drizzle with a little lemon and a touch of pepper. 4. Place thin slices of cucumber over the smoked salmon and top of with remaining slices of bread. 5. Trim crust and cut into triangles or small rectangular slices. 1. Wash watercress and parsley and pat dry with paper towels. 2. Combine cream cheese with butter and chives. Add pepper to taste. 3. Lightly butter 4 slices of bread and top 2 slices with mixed watercress and parsley. 4. 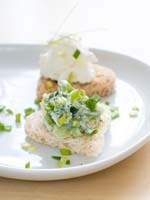 Spread cream cheese and chive mixture over other 2 slices of bread and place on top. 5. Trim crust and cut into triangle or rectangular shapes. Mix 1 tablespoon of olive oil with 1 teaspoon balsamic vinegar, ½ teaspoon honey and ¼ teaspoon mustard finish with pinch of salt to taste. 1. Lightly butter 4 slices of dark rye bread or mixed grain bread. 2. Slice and spread soft blue cheese over 2 slices of bread, place thin slices of pear over the cheese and drizzle lightly with the honey vinaigrette. 3. Place rocket on top, and top with remaining slices of bread. 4. Trim crust and cut into triangle or rectangular shapes. 1. Mix together cream cheese, blue cheese, mayonnaise and chives. 2. Trim crusts and flatten bread with a rolling pin. 3. Spread each piece of bread with cream cheese mix and place an asparagus spear on top. 4. Roll up and place seam-side down.